This is a eulogy for the end of a series and of a company, and also for a game that I loved to death. Little did we all know an 8-year old girl named Clementine would herald in a new form of narrative gaming, and a story to be cherished forever. I’ve played every episode of Telltale’s The Walking Dead. I was initially disinterested in yet another story about surviving a zombie apocalypse, but so much chatter about the game made me realize that the epidemic was a secondary role to the story. When I tried the game’s first episode, “A New Day,” I was hooked. The Walking Dead was unlike any game I had ever experienced. It was episodic, reminiscent of television shows, but with the interactive spin of letting the player decide what to do. I watched videos about what choices other players picked and why. I listened to people grow attached to the characters, hoping death wouldn’t be so inevitable. Six years later, the series, and the company that made it, has come to an end. When I first played The Walking Dead, I mistakenly believed the game was about Lee Everett, a former University of Georgia professor who is convicted of murder after killing a man for sleeping with his wife. As the playable character, the game begins with Lee in a cop car heading to jail, when a zombie derails the car and kills the driver. Lee escapes unharmed, thus beginning his journey out of Macon, where he meets a variety of people hoping to survive, including little Clementine. Telltale has worked with established titles since the company’s inception in 2004. Titles like Back to the Future: The Game and Tales of Monkey Island were the company’s attempt at gaining an audience and earning money with franchises already beloved by millions of people. It wasn’t until they created the first season of The Walking Dead, and created the loving and complex relationship with Lee and Clementine, that they had successfully pulled it off. In an interview with Game Informer, co-project leader Sean Vanaman stated that Clementine was “literally the first idea” he had for the game. Though the player controls Lee for the entirety of the first season, Clementine is always the one with the most control. Unable to find her parents, Lee steps in as a guardian, not only in protecting her against zombies (and evil people), but in teaching her lessons that she will soon need to learn, like how to use a gun. Soon, what Lee, or the player, decides to do is all based off of whether or not Clementine approves. Still, Lee had an impact on the version of Clementine we see today. In fact, Clementine’s race was changed to black because of Lee. While Clementine was always envisioned for the game, Lee was not. According to Vanaman, Clementine was originally going to have a brother be her guardian for the game. “Vanaman decided a pre-existing relationship would be too much to ask a player to take on in The Walking Dead world,” so Lee was born. The team wanted Clementine to look as if she could be Lee’s daughter, so they made Clementine black. Even if both fictional, the two needed each other in order to create the cohesive, and emotionally tense story. The Walking Dead was the first game I played that placed heavy choices in my hands. Despite Telltale’s linear storytelling—here I harken back to the the proverb “Telltale choices don’t matter”—I felt like every choice did matter. Those choices like who to save and who to sacrifice weighed on my heart and hands as I moved from choice to choice, thinking of what to pick before the timer reached zero. The game always ended with the same conclusion no matter your choices, but it was those little changes you made in the story that felt incredibly personal. Not every option needs to create a butterfly effect change of massive proportions. And what Telltale succeeded with the most was its ability to capture human relationships between people, especially between Lee and Clementine. I loved Lee with all my heart. Lee was, for me, the first Black playable character in a game that was not sports-based. I saw in him a father I always wanted. He was to Clementine a father that looked a lot like my father, but was not him in any way, shape or form. While others hung on to Clementine for dear life, I grabbed Lee by the hands, and hoped he’d teach me something along the way. The way Telltale was able to create such a strong bond between two people in a matter of five episodes astounded me, and devastated me when their bond was broken. Lee got bit. He cut off his infected arm, but it was too late. He pushed Clementine as far as he could, then had to let her go. When the choice was given to either let Lee turn into a zombie or kill him to prevent his turning, I told Clementine to shoot. I didn’t want to see his shrunken cheeks, his gray skin, his fate. This ended the first season of The Walking Dead, with Lee dead, and Clementine alone. The Walking Dead became the first game I played with a black, female lead. The precocious little girl quickly became a fan favorite. Across Twitter, hashtags like #MyClementine, #ForClementine, and #StillNotBitten were used by fans throughout the series. For Telltale, Clementine acted almost like a mascot, a representation of a resilient, hopeful person in the midst of destruction. In the second season, Clementine regroups with a few new and old friends. Without the protection of Lee, she’s set to decide for herself who to trust. It’s an overwhelming task. And the abundance of new faces and new decisions feels like a whirlwind, similar to the state of the company itself. By the end of season one in 2013, Telltale had sold more than 21 million individual episodes across all platforms. With the success of the series, the company began to change. More people were hired, causing lack of communication and a lot of confusion within the company. Work expanded exponentially, as the company worked on other IPs such as Game of Thrones, Minecraft, and Borderlands. The success of the game created new burdens and choices for the Telltale team. As reported by Megan Farokhmanesh’s piece, The Walking Dead helped the company hire more people, but in turn created a toxic space for crunch and hostile management. Despite churning out game after game after game, the company was nowhere near thriving. And neither was Clementine. In a trailer for season two, we see old footage of Clementine before the zombie outbreak. She’s small and carefree. The video soon cuts to a new image of her, wounded, and carrying a gun in a blistering snow storm . Her childhood has been abruptly taken from her; the happy times are over. Season two left her with more grief and a new child to protect. Alvin Jr., or A.J., is an infant, born in the middle of the zombie epidemic. With a mother who dies after childbirth, and a father murdered, Clementine becomes A.J.’s guardian throughout the rest of the series. To be honest, I didn’t care about A.J. at all in the beginning. My heart was solely for Clementine, and promising to keep her safe. I tried, a few times, to place the baby with someone else, but Clem had other plans. Once again, Telltale set up a situation where a stranger is set to become a guardian for a child. This time it was Clementine, only about eight or nine herself, fending for an infant’s life. With the knowledge she’d learn from Lee, she set out alone, to find a new home for A.J. and herself. As the series progresses, it’s clear that Clementine will either save A.J. or die trying. Like Telltale, the success of Clem’s mission is contingent on The Walking Dead itself. It’s life or death. For Telltale, it ultimately meant death. On September 21st 2018, The Walking Dead’s Twitter account posted a message, stating that the Telltale was closing down, and laying off the majority of its employees. “We released some of our best content this year and received a tremendous amount of positive feedback, but ultimately, that did not translate to sales,” writes Telltale CEO Pete Hawley. The first episode of The Walking Dead’s final season was released August 14th, 2018. The second episode was scheduled for the 25th, four days after the layoff announcement. Obviously, Clementine has no say as to who will or will not pick up her story. But somehow, she seemed incredibly integral to what was happening in the real world. 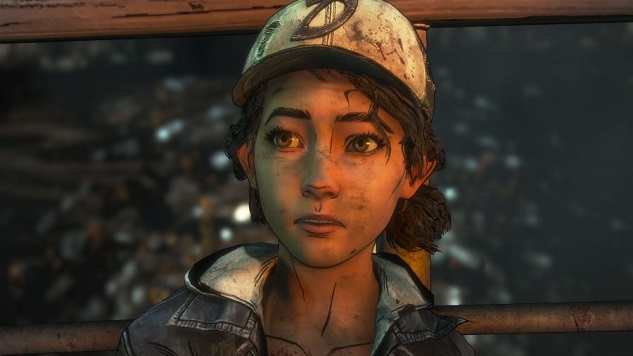 At Hollywood Reporter, Brodie Anderson, executive producer of The Walking Dead: The Final Season, lamented the loss of Clementine’s story due to the company’s closure. “That was the really disappointing thing, that, in addition to not being able to come back to the office with all your great co-workers, that we wouldn’t be able to finish Clementine’s…story,” he said. “The specter of that not being able to see the light of day was painfully difficult.” When Skybound Entertainment decided to take the lead in finishing the final season, the company noted that the desire to finish the season was all because of Clem. So many had grown attached to her and her story, and everyone wanted to see it through to the very end. But does finishing Clem’s story do anything for those who were laid off? Does it help those who underwent months or years of crunch and a toxic work environment? With financial help from Robert Kirkman, Skybound Entertainment was able to fund the original Telltale team that shipped the game’s first season. With that, Clementine and A.J.’s story concluded. It feels as unfair as The Walking Dead itself. Those who survive an epidemic seem to do so through pure luck. Layoffs seem no different. Still, Clementine’s story deserves to reach its finality as much as those laid off deserve every amount of money they are owed. The fact that Clementine was allowed an ending doesn’t negate the importance of those who were lost along the way. By the final episode of the series, titled “Take Us Back,” Clementine is battered. She was bit, but an immediate amputation of her leg prevented her from turning. Now, she’s missing a finger and a leg. She admits to A.J. that if they ever need to run away, she will not make it. They sit in silence, acknowledging the truth in her words. But for the time being, they are both happy. They’ve survived, they’ve found friends, and a home to finally live in. Clementine seems to be at peace, and while we know that that will only be temporary, we can at least be glad that tranquility is there in that moment. Clem, whether intentional or not, will always represent Telltale’s rise and fall. And though Clem did not die in the end like Lee, she dragged herself away from harm’s way, and was beaten down because of it. The series’ original success became what also hurt it. But even in the midst of the company’s slow fall, and in the middle of a zombie apocalypse, Clementine was able to survive. Throughout it all, she is still alive. I see Lee in her, but I also see that she is entirely her own person. She is not #MyClementine; she is her own Clementine. And she is powerful.